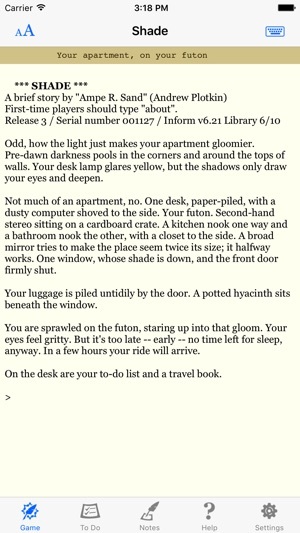 *Shade* is interactive fiction — a classic text adventure. No graphics! No point-and-click! 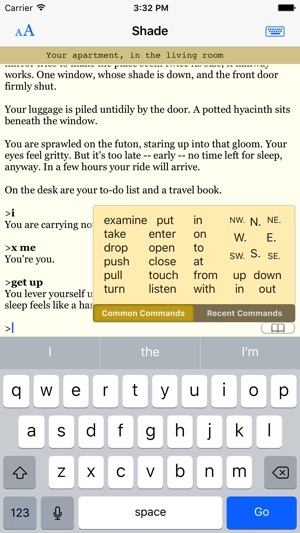 You type your commands, and read what happens next. *Shade* is a snack-sized experiment in surrealism and psychological fear. It begins as a classic “room escape” scenario; but that’s not how it ends. Play *Shade* if you’re in the mood for a short trip into an uncertain, shifting environment that might just be a nightmare. - Fluid interface designed for comfortable typing and reading. 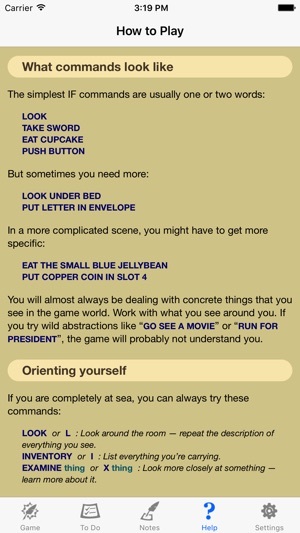 - Achievements tracked through Game Center. Each reveals a new snippet of Death Valley Om installation art, specially written for this iOS release. - Pop-up palette of commonly used commands. 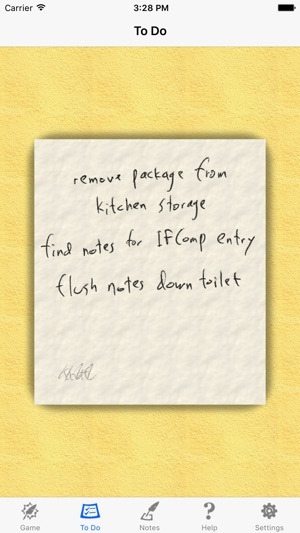 - Includes a handy “to do” display tab (so you don’t have to type “READ LIST” over and over). - Full support for VoiceOver (speech output) and dictation (speech input) on devices that offer these features. *Shade* won the XYZZY Award for Best Setting of 2000. 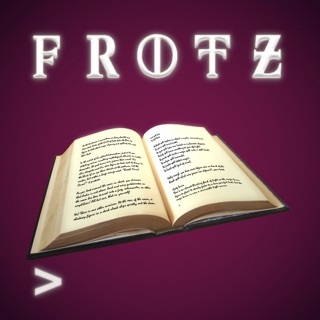 A browser-playable version is also available (for free) on my web site. This is a great little diversion. Well worth the 99 cents! ...and if you get stuck, check your “to do” list. "Shade" is not so much a traditional "adventure" as an experiment in mood and horror. It starts out appearing to be a room escape game, but how it ends ... Though brief, it will mess with your head. The virtual to-do list, available in a tab, is a good bonus over the browser-based version, nicely implemented; check it frequently. For a beginner's game, try the same author's app "The Dreamhold," which holds your hand a lot more.